Ensuring invasive alien plant management delivers biodiversity conservation: insights from an assessment of Lantana camara in Australia. Prioritizing weed species based on their threat and ability to impact on biodiversity: a case study from New South Wales. Improved control of woody borreria (Hedyotis verticillata Lam.) by foliar application of metsulfuron tank mixtures at the vegetative stage. Effects of pulp removal on seed germination of five invasive plants in Hawaii. 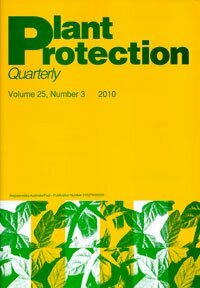 Impact of marking dye, transport and irradiation on eclosion of mass produced Queensland fruit fly Bactrocera tryoni (Froggatt) (Diptera: Tephritidae).